While at Camp Peary, the interviewer asked the recruit a series of focused questions and information requests specific to certain duties and jobs/ranks such as: MM1c (Bulldozer Operator), Milling Machine Operator, Carpenter’s Mate… which needed filling for Seabees. While in the Seabees during WWII, enlisted men between the ages of 17 and 50 earned from $54.00 to $126.00 a month depending on rate and rank. The first Seabee Detachment departed the U.S. January 27, 1942. In November that same year, President Roosevelt authorized the Seabees be expanded to 210,000 men from the initial force of 99 men nearly a year earlier. By the end of the war, more than 325,000 Seabees served on 6 continents and 250 islands. In 1952 Wonsan, a key supply and transportation center for the enemy, fell back into the hands of communist Korea. While fighting to regain essential territory, severely damaged naval aircraft were being forced to either ditch at sea or land behind enemy territory. The Navy need to locate a safe place for them to land. Just as luck would have it “Acey Bone” (ACBONE), the familiar name of Amphibious Construction Battalion ONE, was on the job! They managed to build a lifesaving airstrip quicker than you can cook dinner. Emergency landing strip on Wolmi Do Island. Carrier-based Navy aircraft, making daily attacks on the city of Wonson, were frequently damaged to the degree that pilots had to choose between ditching at sea or landing in enemy-held territory. These losses made finding a safe solution in Allied territory imperative. In June 1952, Vice Admiral P.R. Briscoe directed “Acey Bone” to construct an emergency air strip on Yodo Island in Wonsan Harbor. The small, hilly island had remained behind enemy lines after the Wonsan evacuation, but appeared so unimportant that the North Koreans never took it over. Within easy shelling range of the mainland, it was the perfect place for the Seabees to build the much needed air-strip. Emergency landing strip on Wolmi Do Island from the side. A rapid survey showed that there was only one possible location for the airstrip, a low level area used by the Koreans for rice paddies. After bringing in equipment and supplies “Acey Bone” started construction. Drilling, blasting, filling and grading of the hilly area took just nineteen days to complete. The brand new airstrip was 2,400 feet long and went from one side of the island to the other. On the twentieth day the code message the “Steak Is Ready,” was declared signaling that the airstrip was ready to be used.. This pre-arranged signal was acted on immediately by no less than nine Corsair pilots who all landed on the new field the very first day it was completed. Photograph of members of Acey Bone (ACBONE), the familiar name of Amphibious Construction Battalion ONE, after the invasion. Despite the ease with which the island could be shelled and the constant need for filling shell holes in the airstrip, operations continued for a year. The airfield was named “Briscoe Field” in honor of Vice Admiral P.R. Briscoe. During this time, Navy and Air Force aircraft, valued at over ten million dollars, were saved by utilizing the emergency airstrip and over sixty pilots were spared the choice between capture and ditching at sea. Once again “Acey Bone” showed the true Can Do! Spirt of the Seabees by not only providing a place to land, but doing so in style! 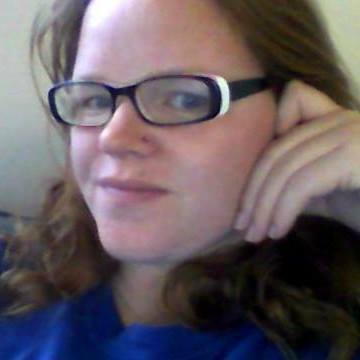 Ingi House is originally from Kansas where she got her B.A. in history from the University of Kansas and M.L.S. from Emporia State University. After working for the Dole Institute of Politics she moved to the East Coast. In Washington D.C. she worked at the National Archives and Records Administration and then at the Defense Acquisition University where she became a Certified Archivist. Her continued enjoyment of military history led her to switching coasts and coming to work for the Seabee Museum where she is collection manager for the archives and records manager liaison. In September 1950 the personnel and equipment of Acey Bone (ACBONE), the familiar name of Amphibious Construction Battalion ONE, participated in the invasion of Inchon, Korea. This decisive victory turned the tide in favor of the United Nations and enabled the recapture of Seoul, South Korea, a few weeks later. Acey Bone was able to set up piers, a tent city, and even provide entertainment, quicker than you can get through your holiday celebrations! Seabees at Wolmi Do during Inchon Invasion. On the morning of September 15th, the Marine Landing Force made its assault at Inchon. The Seabees were right on their heels and one and a half hours after the first waves hit the beach the Seabees had the pontoon cause way launched, assembled, and ready for beaching. Natural obstacles proved the biggest test for building the harbor. Tidal flats and extreme tides led to maximum tidal currents against which the causeway could not be maneuvered. Working against time and tide, the pier was installed after two unsuccessful attempts. Placement of the pier had to be carefully planned in order to provide constant accessibility during both high and low tides. Even with all the Seabee ingenuity, tidal conditions continued to limit operations. To combat this, small crafts were employed to maintain a constant flow of materials across the pier. The combination of pier work and small craft permitted 24-hour utilization of the vital links. Smoke rises from fires and explosions caused by pre-invasion naval bombardment on Incheon, Korea. While pontoons were being placed in the harbor, the beach conditions were also being improved in order to make a workable base. A tent city was constructed while drivers improved roads improving the flow of materials. Seabees with railroad experience also brought Korean locomotives through enemy mortar and fire to supply the troops. They manned this equipment for the duration of their stay. Their fortitude and unusual skill provided unexpected service in support of the logistic operations. All work and no play makes even the best military cranky. No problem with that though, the Seabees took care of that when they installed a theater. The theater proved so popular that once again, the traditional “Courtesy of the Seabees” sign was displayed on a beachhead. Seabees are pictured leaving Incheon Harbor, Korea during the successful redeployment of UN troops to Incheon. Consolidation and improvement operations continued until October 1950, by which time the preliminary work was done and the Base Development phase commenced. In just three short weeks the Seabees had built a pontoon cause way, installed a tent city, worked on making a railway functional, and provided entertainment for the troops! All because Seabees Can Do! World War II made it harder for people to do things, such as find fresh food, buy gasoline and get new clothes. Things were even harder to get if you were in the Seabees, where even cigarettes were rationed. But one thing that every commander tried to provide Seabees was the ability to exercise their right to vote. A 1945 voting broadsheet with information and instructions. 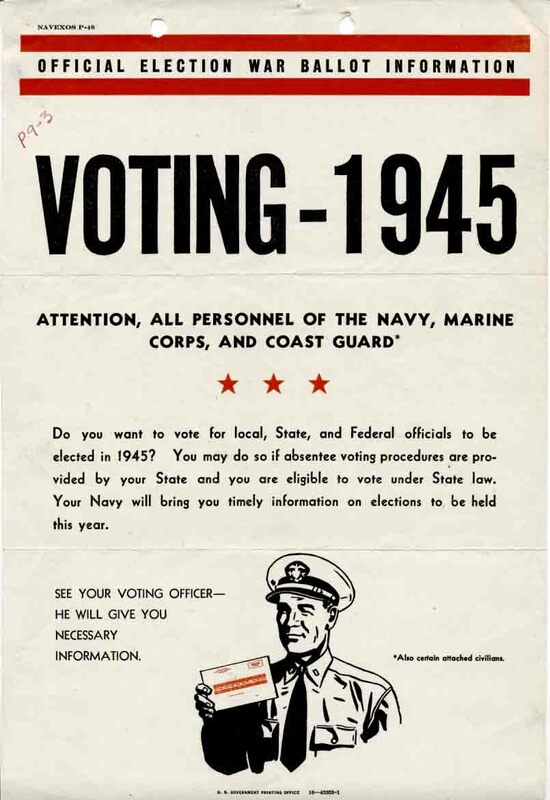 Broadsheets were set up in various locations advertising that the Navy would “bring you timely information on elections” and instructions on how to get the necessary information needed to vote. A memo, circa 1944, instructing the 7th Naval Construction Battalion on the proper distribution of voting cards. After a Seabee was signed up to vote, they voted using voting cards. Instructions were given to the voting officer, who distributed to the rest of the battalion. Making sure that it was as easy to vote as possible was his job. A voting area created out of a tent, October 3, 1944. Once everyone had their voting cards, they needed a place to vote. 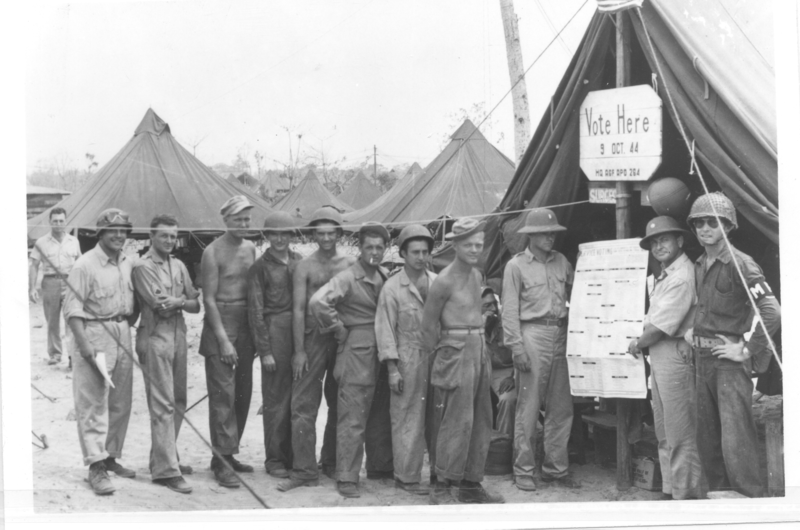 Using Seabee ingenuity, they made voting places and booths. 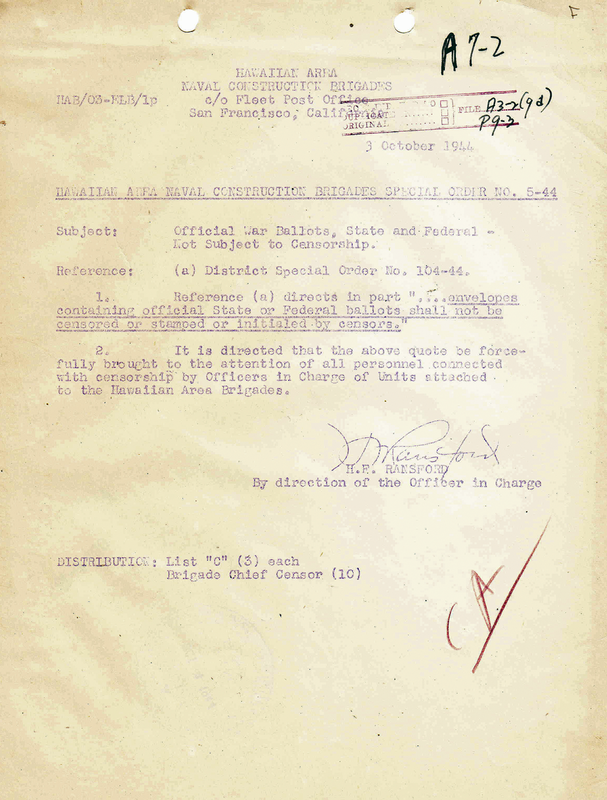 Special instructions on the censorship of voting ballots, Hawaiian Area, Naval Construction Brigades, October 3, 1944. Voting was taken so seriously that special instructions were sent out making sure that “ballots shall not be censored.” This insured that the normal protocol for censoring mail would not be applied to the ballots. 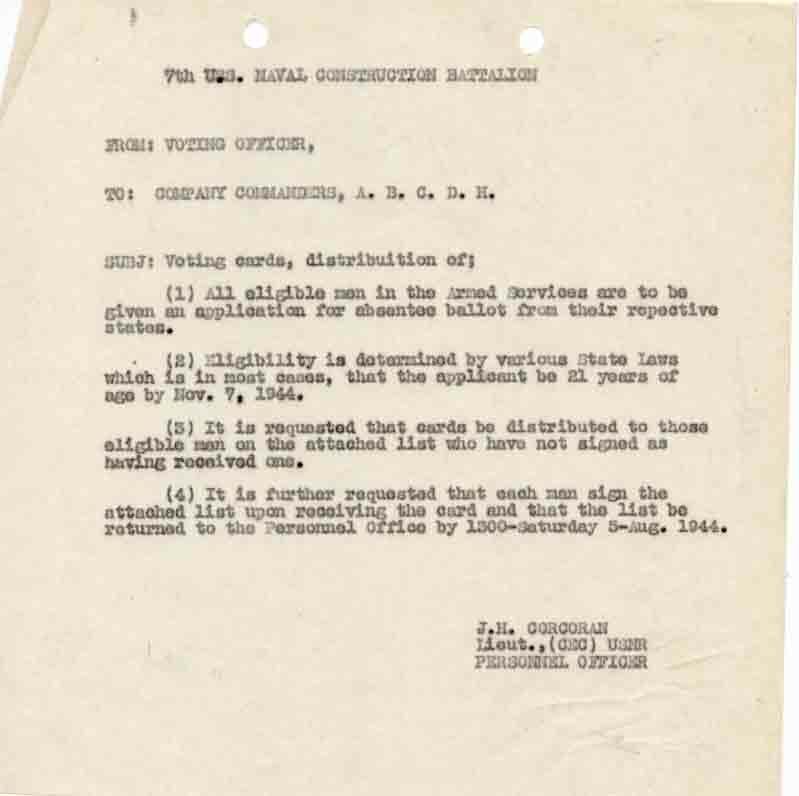 These measures made it as easy as possible for our service men and women to vote in various elections even as the world was engaging in World War II.